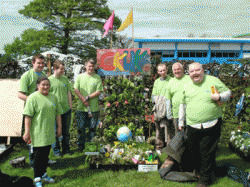 CKGrows2 is a unique 3 year project that will give adults with learning difficulties who have a keen interest in gardening the opportunity to become peer educators. CKGrows2 is funded by the Henry Smith Charity, the Baily Thomas Charitable Fund, the Moffat Charitable Trust, the Bank of Scotland Foundation and Foundation Scotland. CKGrows2 peer educators will be given the opportunity to develop their skills in gardening and will make this learning open to the wider community by producing accessible online learning tools for our website. In addition, each participant will learn about peer education and develop their skills in how to teach other people.Our peer educators will become involved in local community gardens and colleges across Glasgow by running workshops for other people interested in gardening. CKGrows2 peer educators will become role models for other adults with learning difficulties. They will change negative perceptions of people with learning difficulties and demonstrate that they have a range of skills and talents to contribute to their local community.